Just now, I did my usual "Mindi Scott" search first. And got my usual results mentioned above. 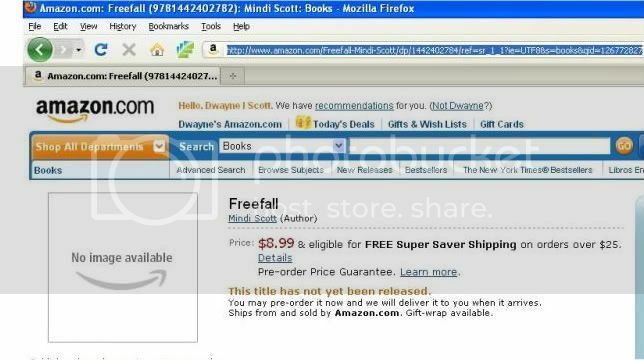 Then I immediately tried "Freefall Mindi Scott". Shocked, I went back and searched for "Mindi Scott" again. Batman Returns is still the first item on the list. But the second is me! And my book! Was Amazon right in the midst of adding this at the exact moment I was searching???? Click here to see the whole glorious page for yourself! As you can see, the cover art isn't available at this moment and the description is kind of vague. But still! My book is on Amazon! It has ISBNs and is 288 pages! It's available for pre-order RIGHT NOW! And for only $8.99!